The following DIY documents my oil change procedure for the US Ariel Atom with the supercharged Ecotec engine and "flex hose" air intake system. Now that that's out of the way, an oil change on the Ecotec Atom is not technically complex - it just requires patience and a lot of time. Commercial shops may not have the time to spend on your Atom, and in any event you can save a lot of money by doing the work yourself rather than paying for several hours of shop time. Further, you can ensure that your Atom gets put back together with all the proper hardware if you do the work yourself. You will need one of the three possible oil filter wrenches. In this DIY I use the new-style Brammo wrench, as that is what most Atom owners will have. The procedures in this DIY may need to be modified slightly if you use one of the other types of wrench. You will also need either a filter insert (AC Delco part PF457G / Saturn part 12605566 / compatible aftermarket filter) or a filter insert and cap combo (AC Delco part PF2259G / Saturn part 12580254). It is a good idea to have a spare cap, since you may chew up the plastic nut on the old cap while trying to remove it. The aftermarket filter shown in this picture is a WIX 57082. You will also need either the car ramps or the jack and jackstands. Both methods will be illustrated in this DIY. If you have both options available, I suggest using the jack and jackstands. 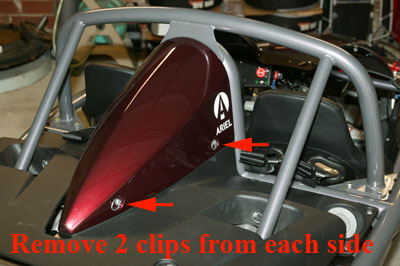 Remove the four 1/4-turn fasteners from the airbox cover as shown in this picture. Keep track of which clip is which, as the rubber washers on the clips may be of different sizes. 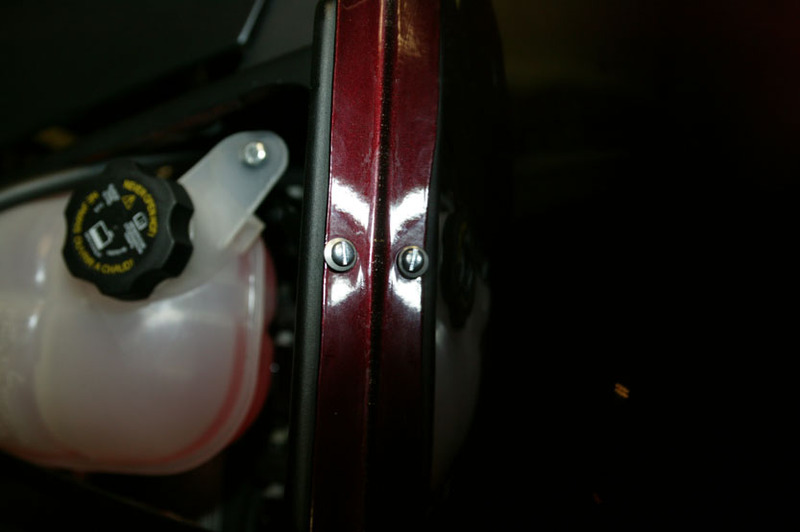 Also, make sure the washers stay with the clips rather than sticking to the airbox cover. Now, set the airbox cover on a soft surface. Here, I've placed it on a towel to prevent it from being scratched by the concrete garage floor. You can also see that I've positioned the four 1/4-turn fasteners by their matching hole, to keep them in the proper sequence. If your car has the rollbar option installed, you will need to remove it to perform the oil change. Trust me on this - it looks like you can slide the rear fiberglass pieces out of the way and leave the rollbar installed, but it won't work. 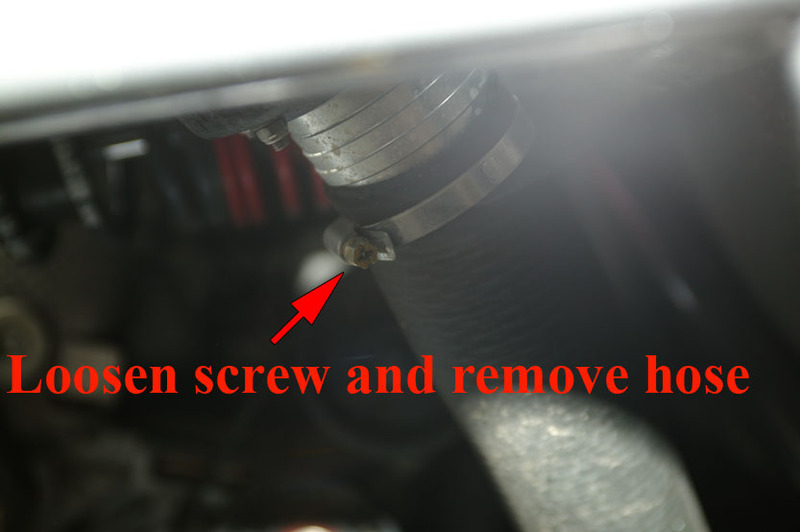 Start by removing the two 5/16" Allen bolts attaching the rollbar flange to the airbox hoop as shown in this picture. 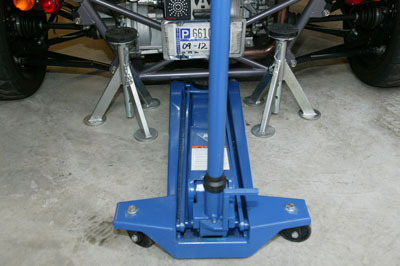 Next, remove the two 3/8" Allen bolts attaching the rear rollbar arms to the rear frame subassembly on either side of the engine. Note that these arms may be under some spring tension, so be careful when removing these bolts. 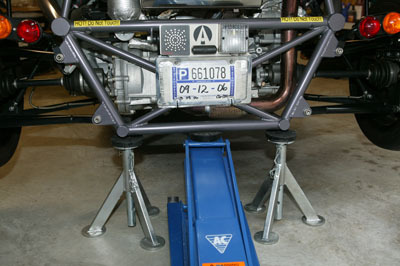 Last, remove the six 9/16" bolts attaching the rollbar hoop to the frame (three on each side). 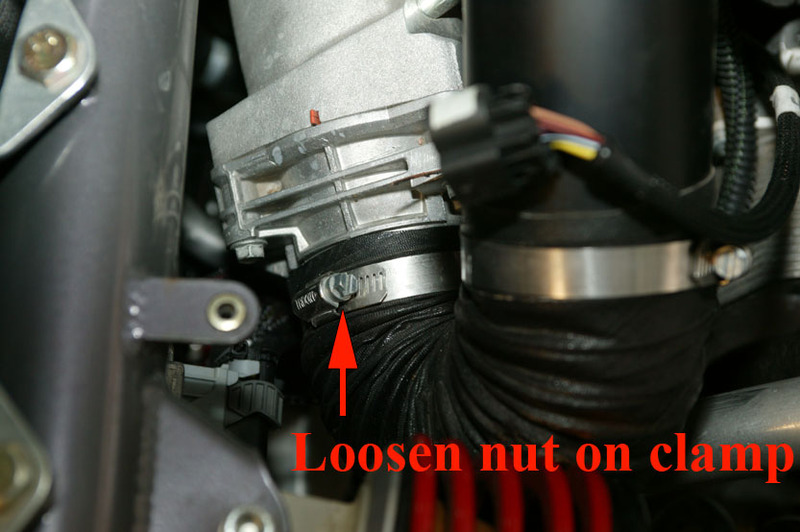 The nuts are not captive, so use a socket on them to keep them from falling behind the seats. 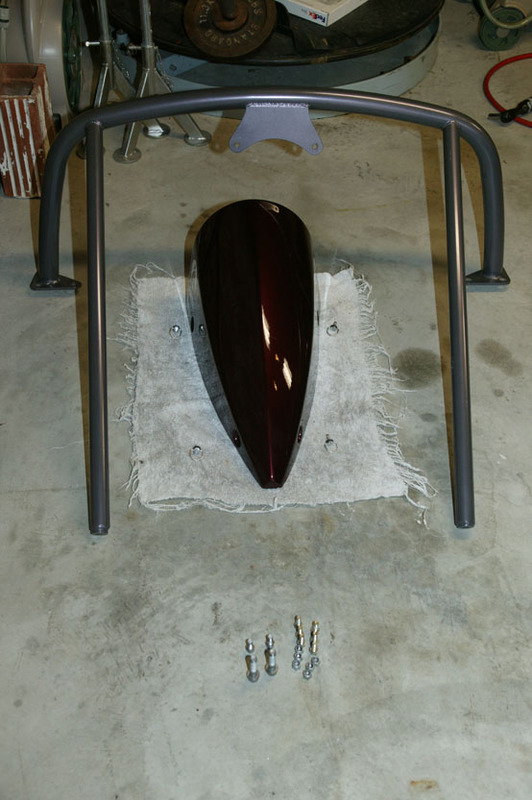 Carefully lift the rollbar up and set it aside, along with its mounting hardware. 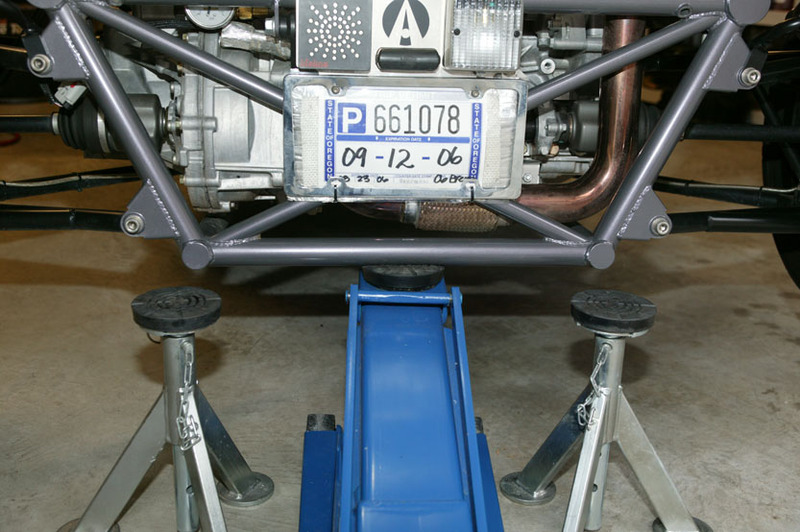 If you will be using the car ramps, place the ramps behind the rear tires and carefully back the rear of the car up onto the ramps, as shown in this picture. Be sure to leave the car in 1st gear when shutting it off, and engage the parking brake. 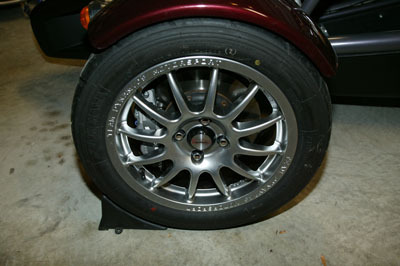 Place wheel chocks in front of each front wheel to prevent the car from rolling forward during the following steps. If you didn't use the ramps, you should now position the jack and jackstands. 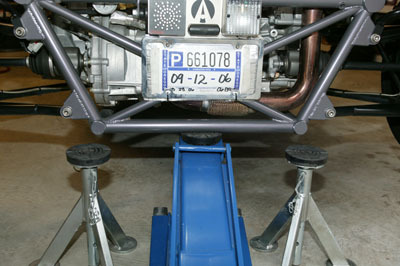 Place one jackstand just behind each of the two rear jackpoints where all the chassis tubes come together at the bottom rear of the car. 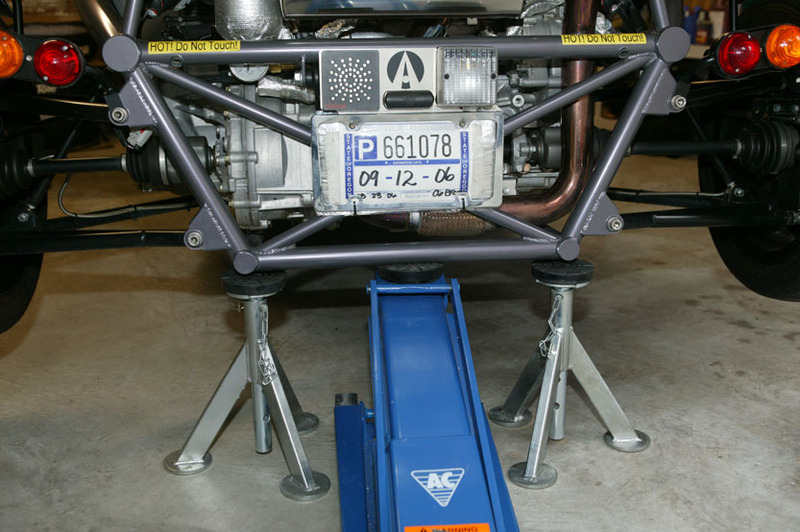 The jackstands can be set at their lowest height - all you need to be able to do is slide your oil drain pan in there. Place the pad of the jack at the center rear jackpoint (evenly spaced between the two jackpoints described above). You will need a low-clearance jack for this procedure. The jack shown is an AC Hydraulics DK13HLQ. Proceed to jack up the car until the rear jackpoints just clear your jackstands. 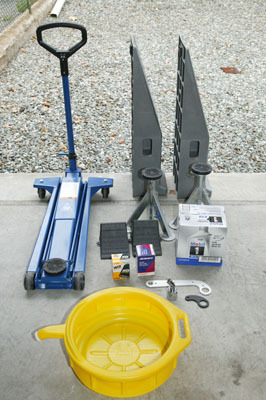 Slide your jackstands into position below the jackpoints and slowly lower the car onto them by lowering your jack. Now, remove the jack. 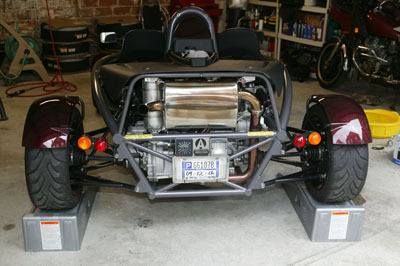 This would be a good time to inspect the front wheel chocks to make sure the car hasn't moved while being jacked up. 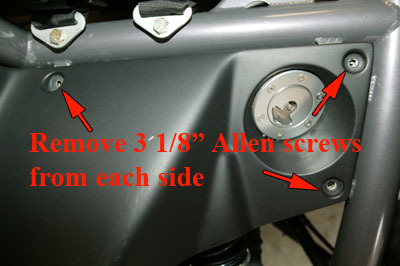 Using a 1/8" Allen driver, remove the three screws holding the air snorkel to the airbox as shown in this picture. Carefully tilt the air snorkel forward to expose the air filter. Carefully remove the air filter, using caution to not let any of the accumulated insects, gravel, etc. fall into the airbox. Once you have removed the filter, you can tilt the air snorkel back and remove it. Set it and the air filter aside. 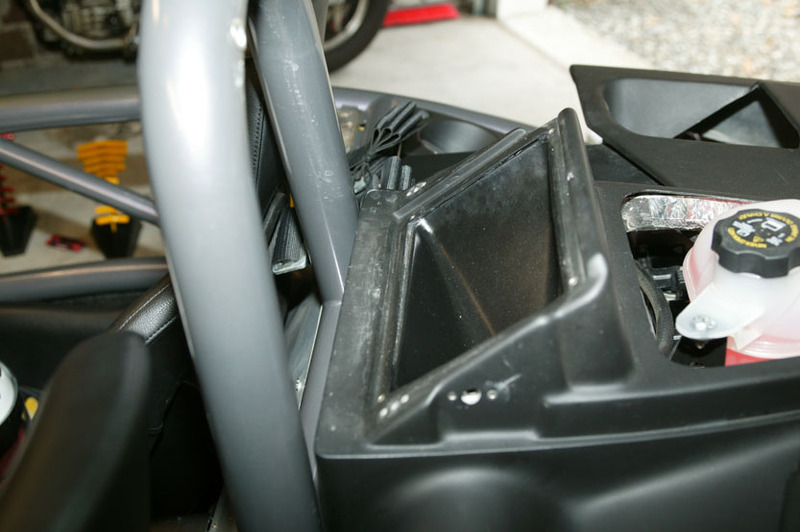 Using a vacuum, remove the collected debris from the airbox. Also, vacuum the air filter and snorkel. 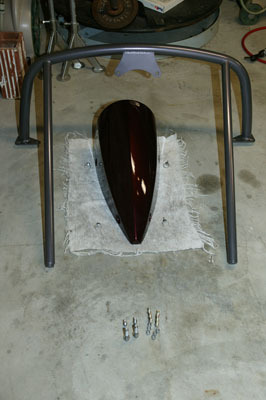 Next, remove the four 1/4-turn fasteners holding the rear "tea tray" to the frame. Again, take care to not mix up the various spacers on the fasteners. Set the tea tray and fasteners aside. 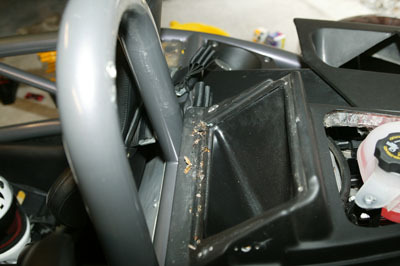 Here is the accumulation of parts we've removed so far. Note that the tea tray fasteners are sitting on their respective locations on the tea tray to make identification easier during re-assembly. 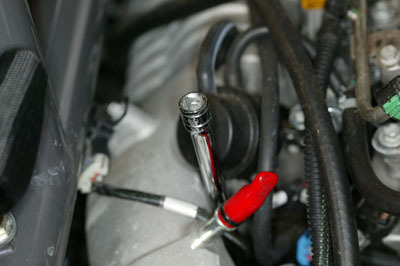 Using a slotted screwdriver, loosen the hose clamp which holds the flexible fuel line onto the stem of the fuel filler. Slide the clamp down the hose and carefully work the hose free from the stem. It may bind on the ribs of the stem. 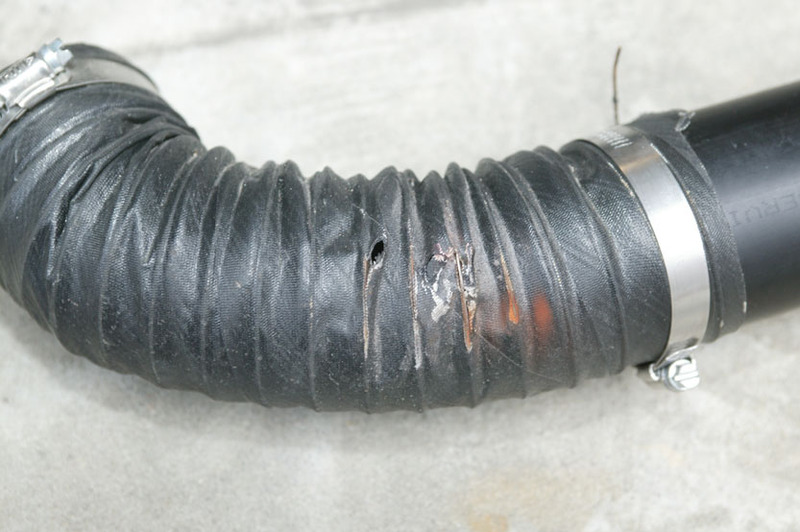 CAUTION: If you recently filled the gas tank and topped off, there may be gasoline in the flexible fuel line. 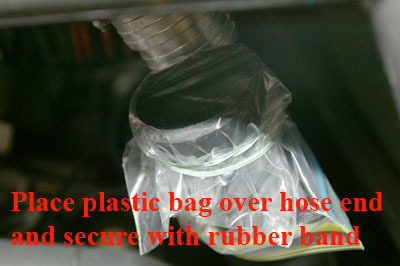 Place a plastic bag over the exposed end of the fuel line and fix it in place using a rubber band. This prevents foreign objects from falling into the gas tank, as well as keeping gasoline vapors from escaping. 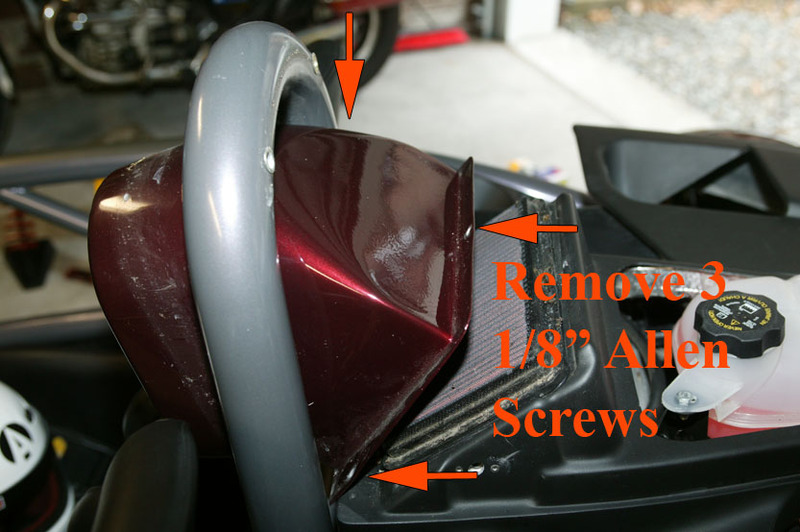 Using the 1/8" Allen driver, remove the three screws from each side which hold the rear deck to the frame behind the driver and passenger seats. 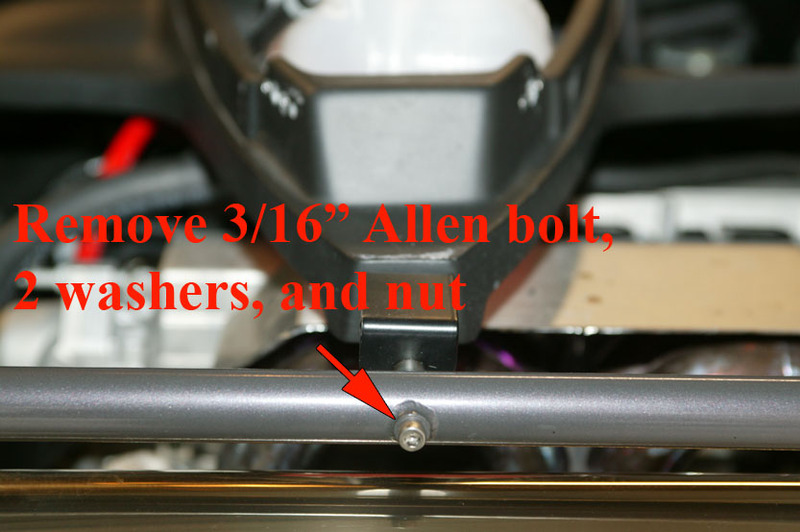 Using the 3/16" Allen driver, remove the bolt holding the rear deck to the rear frame. Note that there are two washers and a nut in this assembly, and be careful to not drop them into the engine. Gently lift the rear deck up to expose the air hose connecting the supercharger to the airbox. Loosen the hose clamp closest to the airbox, slide the clamp down the hose, and remove the hose from the airbox (you may need to wiggle it a bit). Set the rear deck / airbox assembly aside. 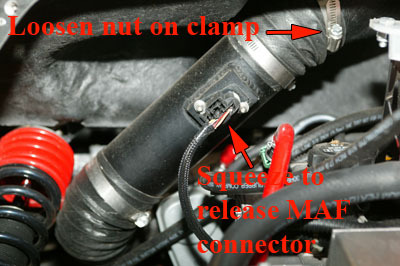 While you're in this area, squeeze the connector shown in the picture to release the cable from the Mass Air Flow (MAF) sensor on the tube and unplug it. Let the cable dangle (you may want to label it if you're nervous about reassembly). Your car should now look like this. Using your slotted screwdriver, loosen the hose clamp connecting the other end of the air hose to the supercharger. Then wiggle the hose to release it from the supercharger. Some people would now suggest covering the supercharger inlet to prevent foreign objects from entering. I don't do this in this DIY because the air inlet valve is normally closed, the supercharger inlet points slightly downward, and there is a risk of forgetting to remove whatever you put over the inlet, thus sucking in something larger and worse than particulates. 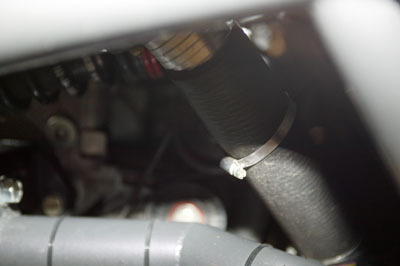 If you have a particularly dirty shop, you might want to put a rag or similar object over the inlet - just DON'T forget to remove it before starting the engine!. At this point, perform an inspection of the air hose you've removed. Look for any damage. In this picture, you can see that the left rear springs have worn a number of holes in the flex portion of the hose and the exposed pieces of the spiral wire that supports the hose have started to rust. If the hose is damaged, obtain replacement pieces from an auto parts store and cut / bend them to match the damaged pieces. CAUTION: The Mass Air Flow (MAF) sensor in the rigid part of the hose is extremely fragile and expensive. Take care to not drop the hose, and to avoid getting foreign objects in the hose. At this point, we have enough items removed that we can see the oil filter cap. This picture is looking at the engine from the left side. The large object to the left is part of the supercharger, and the diagonal object behind the arrow is the oil cooler. 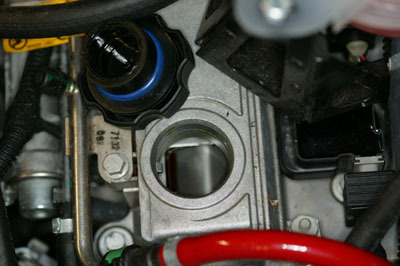 In a small space behind those two objects, you can see the hexagonal oil filter cap. There may be cables or other objects in the way. Most electrical cables have enough slack to be moved out of the way, or can be unplugged from their sockets (be sure to label everything and/or take notes so you can put your car back together again!). 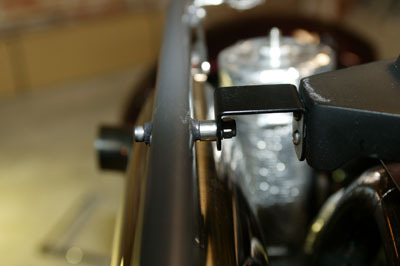 The shifter linkage cables may also pass near / over the oil filter cap and you may need to move them out of the way. It may help to select different gears with the shifter, as different gears put different loads on the two shifter cables. CAUTION: Before taking the car out of 1st gear, be sure the wheel chocks are tightly in place, and after moving the cables, place the car back into 1st gear. With the cables out of the way, you should be able to place the oil filter wrench onto the oil filter cap. If using the new-style Brammo wrench, insert your long 3/8" drive extension shaft into the 3/8" opening on the wrench. 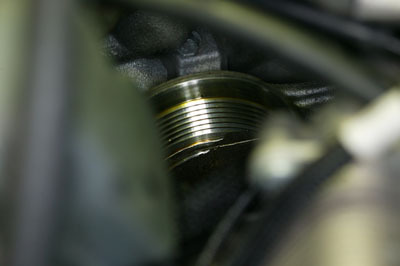 If you have done this properly, the shaft will just clear the supercharger as shown in this photograph. Attach the ratchet handle and turn the handle counter-clockwise. You should be able to make about 1/6th to 1/12th of a turn. Now, reach in and lift the wrench off the oil filter cap and place it back in the original position. Repeat as needed. 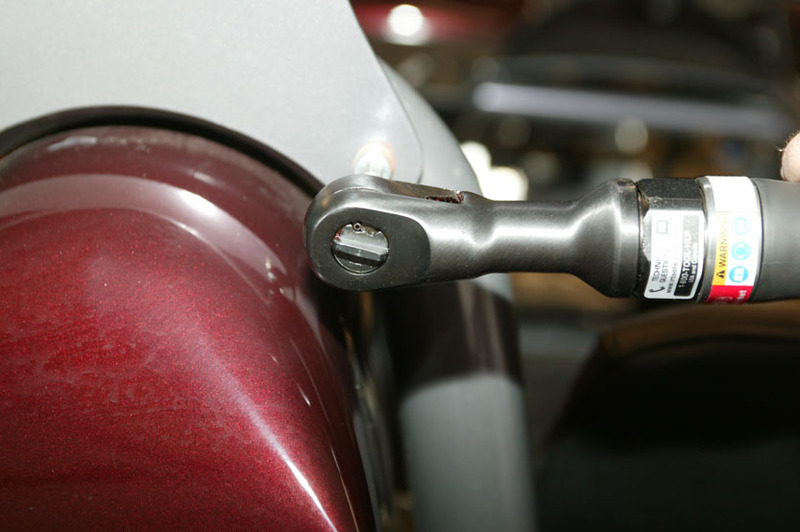 Within about one turn, you should be able to remove the 3/8" drive extension and simply turn the Brammo wrench by hand. After another 2 turns, you should be able to remove the Brammo wrench and turn the filter cap by hand. At this point, stop turning (leave the cap on for now) - you've proven you can remove the cap and it is Ok to drain the engine oil. 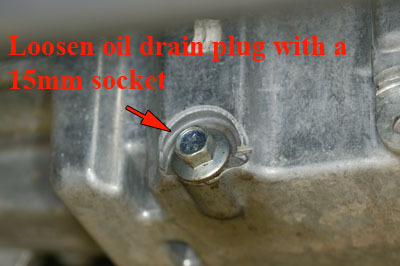 Locate the 15mm oil drain plug at the bottom rear of the engine. Place the oil catch pan so that the oil coming out of the drain hole will fall into the pan. Using the ratchet, loosen and remove the drain plug. If you've run the engine recently, the oil may be warm or hot. Use caution to avoid burns. Leave the pan in place as it will take some time for the oil to fully drain. If your car has the Masterlube oil accumulator fitted, there is probably oil stored in the accumulator, which you want to release. You can tell this by the accumulator gauge reading more than 30 PSI. 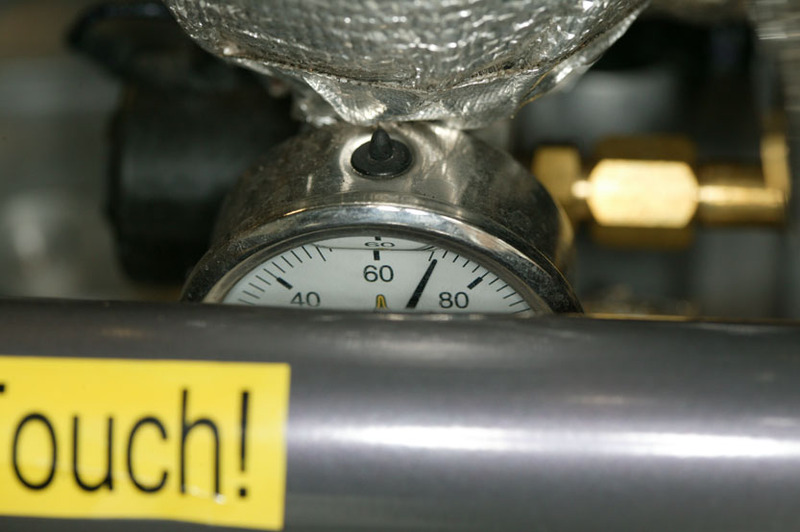 Turn on the engine switch to open the accumulator valve, but do NOT start the engine. 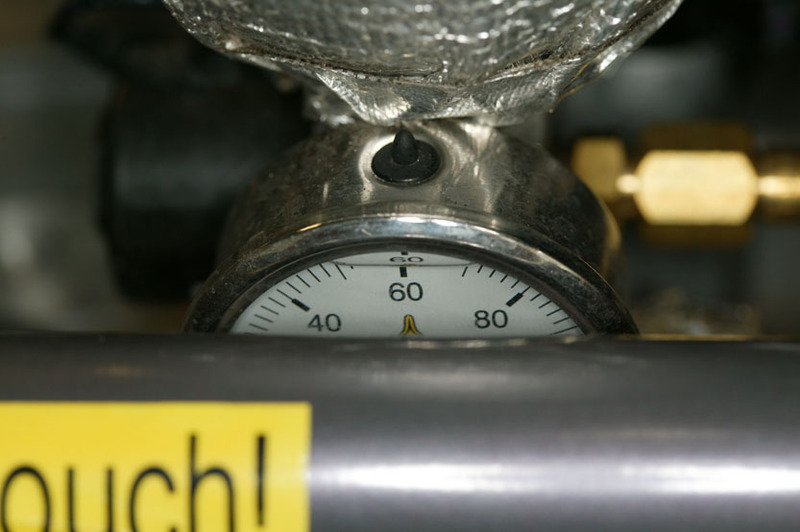 After a minute or less, the accumulator gauge should read less than 30PSI. At this point, turn the engine switch off. By the way, that sticker doesn't say "ouch!". It is part of a larger sticker that says "HOT! Do Not Touch!". Here we see that the accumulator pressure has dropped, indicating that the stored oil has been released. The oil will be continuing to drain from the engine. You will probably collect 5 to 5.5 quarts. 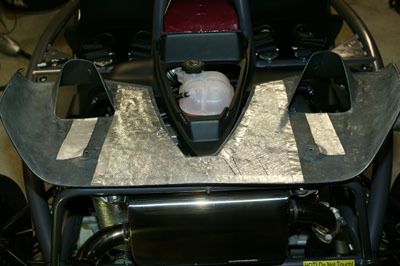 With the car raised in the rear, some oil will still stay in the oil pan due to the way it is angled. 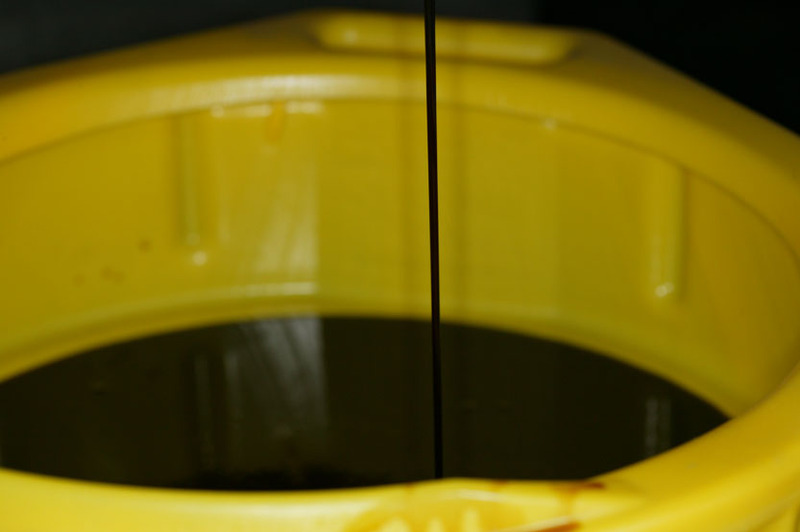 If you are collecting oil in a sample kit for analysis (for example, from Blackstone Laboratories or Dyson Analysis, this is a good time to fill your sample bottle(s) as the oil sent for analysis should normally be neither the first nor the last oil out of the engine drain. 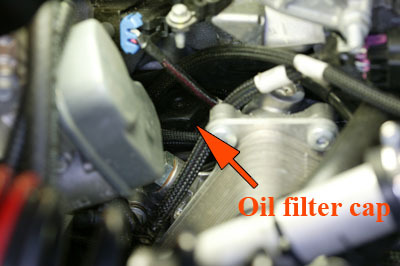 As the oil contines to drain, we will go back to fiddling with the oil filter assembly. Reach in and unscrew the oil filter cap the rest of the way. Chances are, you won't be able to lift the cap and filter out as a combined unit because of the tight clearances. Instead, lift the cap up enough that you can get a grip on the oil filter itself and wiggle it free from the cap. If you purchased a replacement cap and filter combo, you can practice on that to see how the two go together. Once you have the filter and cap separated, you can remove each piece from the engine bay. Have an oil-resistant surface handy to place the used filter on, so you don't get oil all over your work area. 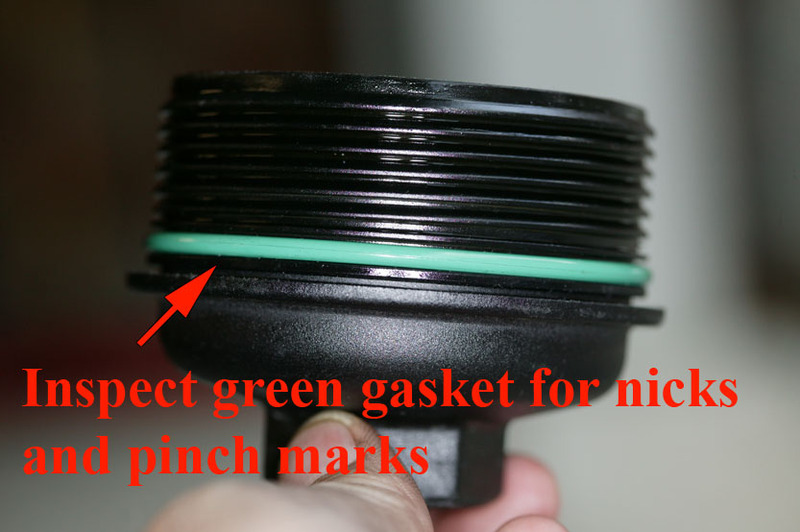 Inspect the green gasket on the oil filter cap for any nicks or pinch marks. If any damage is evident, use your replacement cap. This gasket is the only thing that keeps oil from spraying out of the filter housing and getting all over your engine. 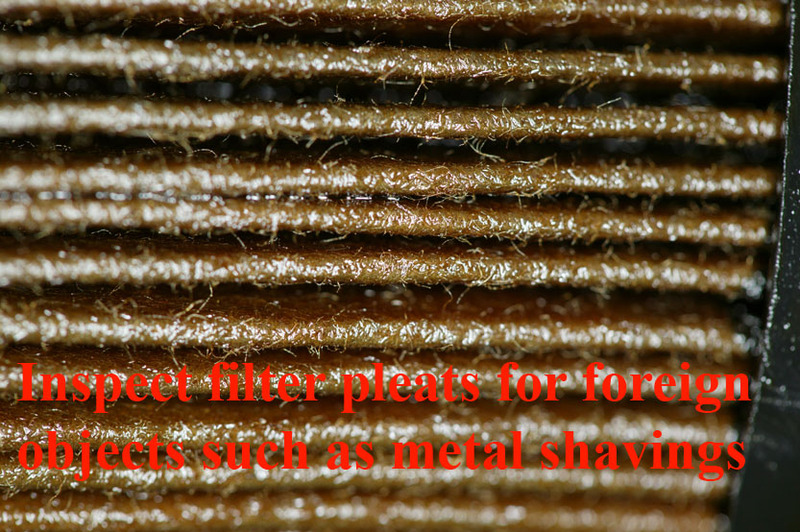 Similarly, take a look at the pleats of your old oil filter to see if there are any foreign objects trapped in the pleats. 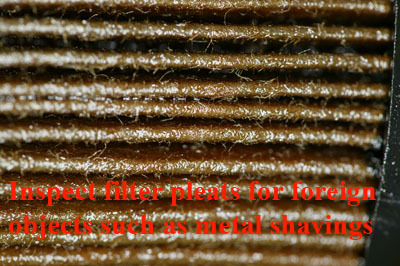 If you see anything such as metal shavings in there, stop the procedure and consult a qualified repair shop. Here you can see the oil filter housing in the engine. At this point you'll want to install the new oil filter and either the old cap or a new cap, depending on the condition of the old cap. First, use a little oil (the old oil is fine) to lubricate the green gasket on the oil filter cap. Reversing the steps you used to remove the filter and cap, get the filter and cap into the space between the supercharger and the oil cooler. Carefully insert the filter into the cap, then insert the whole assembly into the housing in the engine. 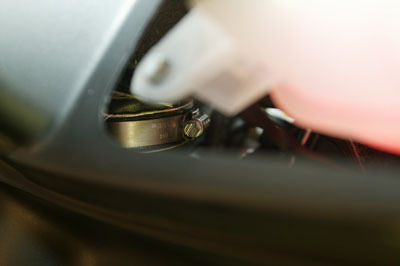 Hand-tighten the filter cap until you encounter resistance, then use the Brammo wrench to continue tightening. Finally, tighten with the 3/8" drive extension and ratchet. Normally one pass with the wrench and ratchet will get things tight enough. The GM factory spec for the filter cap is 18 foot-pounds (per the GM tuner book), but with the Brammo wrench on the cap, you won't get an accurate reading from a torque wrench up at the end of the extension. Next, once the oil has finished draining from the engine, lubricate the washer which is part of the engine drain plug with some oil and re-install the plug. Use the 15mm socket to tighten it and torque to 18 foot-pounds (per the GM tuner book). Now, remove the oil filler cap from the top of the engine (just forward of the coolant reservoir) and add 5 quarts of Mobil 1 5W30 "fully synthetic" motor oil and replace the filler cap. The engine may require more oil than this, but we'll check this with the dipstick later, once the oil has moved down to the oil pan and oil accumulator. 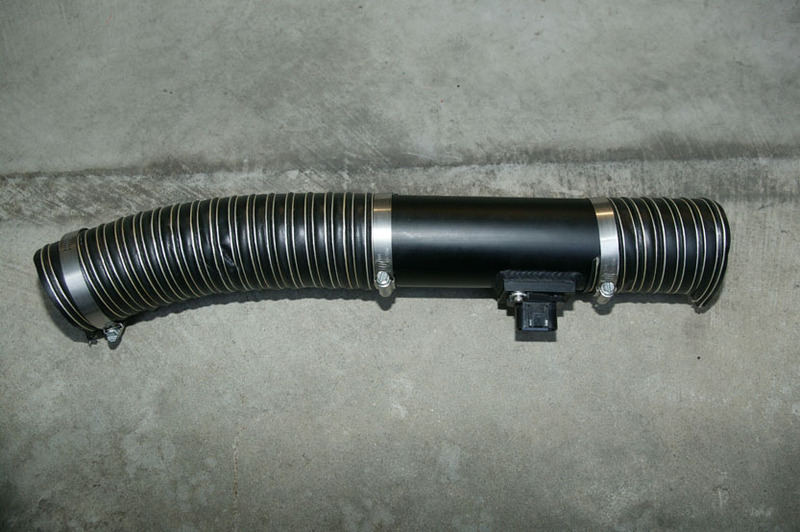 If your inspection of the old air hose showed any problems, replace the worn pieces with replacement parts and re-assemble the air hose assembly as shown in this picture. 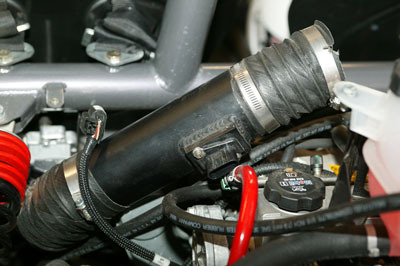 Re-install the air hose assembly onto the supercharger inlet (the long piece of flex hose is the supercharger end) and reconnect the MAF cable to the MAF sensor. You may need to wiggle the hose assembly a bit to get things to line up correctly, particularly if you have replaced any of the flex hose. At this time, you can lower the car back onto the ground. 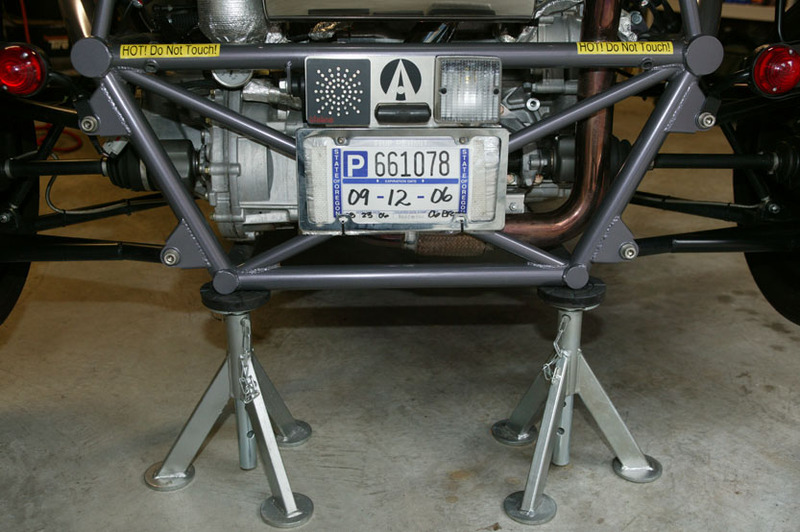 If you used jackstands, position your jack under the rear cross-member as before and lift the car slightly so that it is no longer resting on the jackstands. Remove the jackstands and gently lower the car to the ground. If you used ramps, remove the wheel chocks from the front wheels, get in the car and carefully roll the car forward and down the ramps. This would be a good time to clean the engine area, since you have everything apart anyway. I use a mixture of Zaino Z-6 and water, sprayed on and wiped off with blue shop towels. 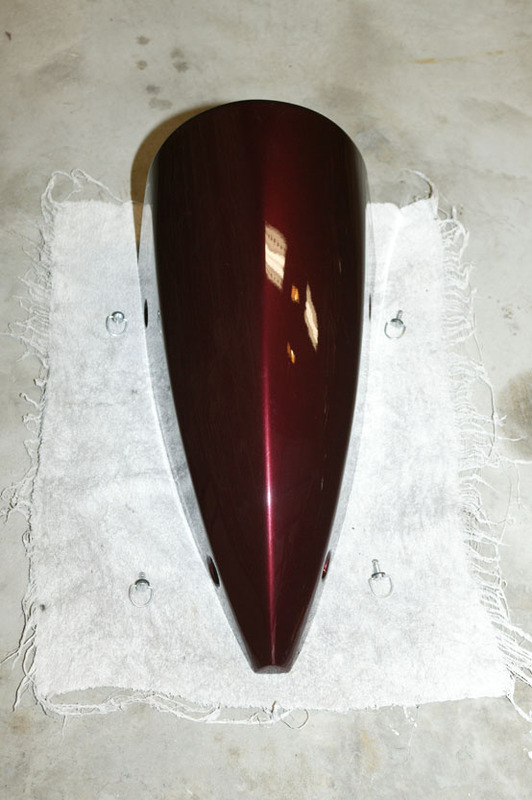 I used this same mixture on the painted body panels (airbox cover and snorkel), as well as the metal hoop around the snorkel. 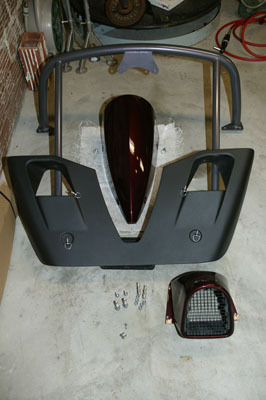 For the black fiberglass components, I used Stoner Invisible Glass, sprayed on and wiped off with a blue shop towel. For both materials, be sure to spray some cleaner in the indents where the 1/4-turn fasteners go, as crud tends to accumulate in those areas. 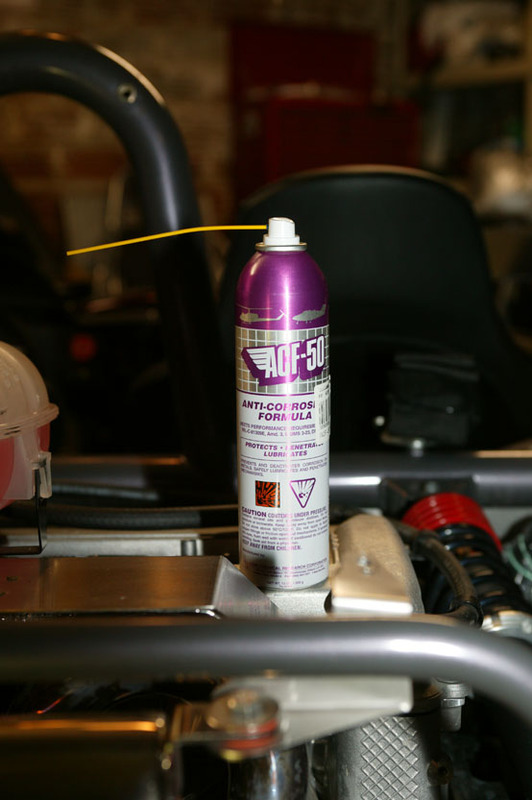 Since the engine is exposed to the elements, I treat it regularly with ACF-50, an aircraft anti-corrosion material. I spray it onto the various cast parts of the engine, trying to avoid plastic/rubber materials as well as the exhaust system (while the manufacturer's web site says it is safe for these areas, I don't want to take chances). Once the surface has been sprayed, I use blue shop towels to spread it around and wipe off the excess. At this point, you're ready to re-install the rear deck. First, inspect the thermal foil on the underside of the rear deck to make sure it is in good condition, and repair / replace if necessary. Next, slide the remaining hose clamp onto the air hose and make sure it is free to slide up and down the hose. Carefully position the rear deck in approximately the correct position and slide the air hose onto the air filter housing connector. This connector is quite a bit smaller than the diameter of the air hose and should slide easily into the hose. Now, slide the loose clamp up the air hose and tighten it with a screwdriver inserted through the gap between the rear deck and the coolant reservoir. Be careful to not overtighten this clamp, as the air filter housing is made of fiberglass and can crack if too much pressure is applied. Remove the protective plastic bag and rubber band from the fuel filler line and slide the filler line back onto the gas cap housing as shown in this picture. Then slide the filler line clamp back up the line and tighten it. Next, re-install the six 1/8" Allen screws (making sure the metal and rubber washers are still in place) in the six holes in the rear deck and tighten. Do not over-tighten as you can crack the fiberglass. Re-install the 3/16" Allen bolt, two washers, and nut as shown in this picture. The thicker washer goes between the tubing and the deck bracket and the thinner washer goes between the deck bracket and the nut. Tighten. Now, place the air snorkel in position and tilt it forward so you can re-install the air filter. Be sure to install the filter right-side-up. Tilt the air snorkel back and align its mounting holes with the holes in the rear deck. You may want to replace the three 1/8" Allen screws with regular slotted head screws as I have done in this picture - it makes it a lot easier to turn them unless you have a really long Allen wrench. Since they are concealed by the airbox cover, it doesn't matter that they don't match. If you change the screws, be sure to move the metal and rubber washers from the old screws to the new screws. Again, use caution and do not over-tighten the screws. Now, do one last check to make sure that you re-connected all the wires you disconnected while working on the oil filter, and make sure you don't have any parts left over (other than the pieces we didn't put back on yet). Check under the car for any pools of oil, which would indicate that you didn't tighten something appropriately. Using the dipstick, check to make sure that you have oil in the pan and that it is between the low and high limit marks on the dipstick. Start the engine as usual. Observe the oil pressure on the instrument cluster or Masterlube accumulator (if installed) and ensure it is 60PSI or higher at idle. Let the engine run until the engine reaches operating temperature (170 degrees or warmer on the instrument cluster). If you haven't checked your tire pressure lately, you can check it now while the engine is warming up. The manual specifies 18 PSI for the front tires and 20 PSI for the rear tires for road use. Individual preferences vary. Pay attention for any unusual noises or "hunting" of the idle up and down. If the idle speed moves up and down, you probably have an air leak somewhere between the supercharger inlet and the air filter. Assuming no odd noises or hunting, shut the car down once it has reached operating temperature. Wait 5 minutes, then check the oil level with the dipstick. Add (via the filler cap) or remove (via the drain plug) oil if needed to obtain a reading within the center 3 markings of the dipstick. Turn the tea tray over and inspect the thermal foil for any damage. Repair / replace as necessary. Turn the tea tray right side up and attach it with four 1/4-turn fasteners, making sure that you have the right washers on the fasteners and they hold the tray snugly. Re-install the airbox cover with four 1/4-turn fasteners, again taking care to ensure that you have the right washers for each position. 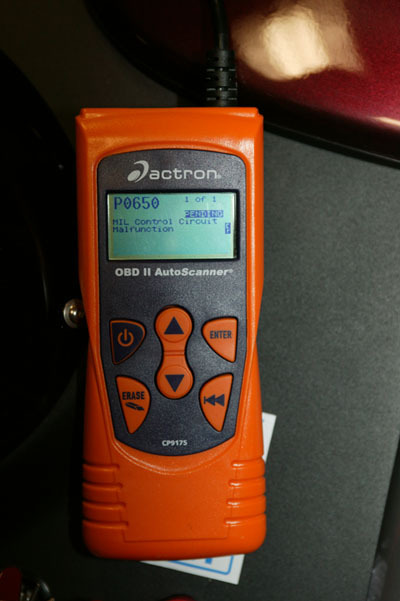 If you have an OBD-II code reader, this would be a good time to read out any codes that the engine is generating. Codes P0650 (MIL check light circuit malfunction) and P0230 (fuel pump relay malfunction) are expected at this time, though that may change in the future. Also, you may have a P010x code for the Mass Air Flow sensor. If you have any other codes, make a note of them and inquire via the usual channels as to what they mean. You can also clear any history codes at this time. If you removed your rollbar, re-install it at this time. Accessibility Policy This page last modified on Tuesday, 02-Jul-2013 07:36:29 EDT. So, what's a glaver anyway? 13 hits this week, 19318 since 10/23/2006.